Telephone 615-885-1515 -- Open 7 days a Week from 8:30 am until 9:00 pm. What’s there to do in the Opryland and Music Valley area? The Grand Ole Opry House in Nashville, TN. The Willie Nelson and Friends Museum and General Store is located in the heart of the Opryland area of Nashville, also known as Music Valley . This area is well known and things to do in the Music Valley and Opryland area include live entertainment, fun activities and great shopping. We’re only minutes from the honky tonks of downtown Nashville and just off Briley Parkway (SR 155) at Exit 12. 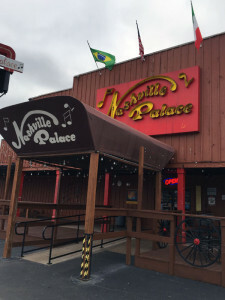 Be sure and visit our neighbor, the “World Famous Nashville Palace” .Where you’ll always hear great LIVE traditional country music. It’s where Randy Travis and Alan Jackson got their start in the business. Right across the street from us you’ll find the Gaylord Opryland Resort & Convention Center which has a wealth of attractions, from an indoor river to a dancing waters light show, and numerous dining options. The newly opened Madame Tussauds Nashville wax museum features life-like wax figures of many country music and pop music icons. A few hundred yards down the road you’ll find the General Jackson Paddlewheel Showboat. The General Jackson is a great way to cruise the river while listening to some great music shows while having dinner. Along Music Valley Drive you’ll find lots to do and lots eat. Watch a dinner show at the Nashville Nightlife Dinner Theater or relive the days of Elvis at the “A Tribute to the King” show at the Texas Troubadour Theatre. 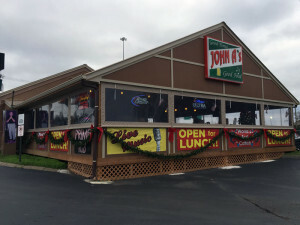 Forget the chain restaurants…eat at locally owned John A’s Restaurant and Bar. As the sign says, “Good Times Good Food” and it’s true. They also have great live music and the world’s best catfish. In the mood for some live country music? Next door to the Opryland Hotel you’ll find the heart of country music – the Grand Ole Opry House. The “Opry” is a country music institution that you’ve got to experience. And the great thing is it is within walking distance of the Willie Nelson and Friends Museum. After the Opry you can head over to the World Famous Nashville Palace (next door to us) and listen to some of Nashville’s best live country music while enjoying your favorite food and beverages. Who knows, you might have even seen it before on the hit TV series “NASHVILLE” which filmed several episodes there. 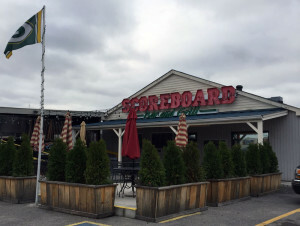 The Scoreboard Bar & Grill featuring fresh smoked BBQ and the coldest beer in town. You can also enjoy some great food and live music at John A’s restaurant where the stars really do drop by. Across the street you’ll find the Scoreboard Grill where they smoke their own BBQ right beside the building and don’t forget the Caney Fork River Valley Grille where you can dine on catfish, steaks and several “wild game” offerings – all located within walking distance from our museum. We’re family friendly so take the kids to the Grand Old Golf & Go Karts’ for some go cart racing and golf. And don’t forget to stop by Cooter’s Place, the “Dukes of Hazzard” themed retail store featuring the General Lee, props, and memorabilia from the popular TV show. They’re our next door neighbor! Finally, if you still have the energy then head over to Opry Mills Mall where you can shop – and eat – your heart out at dozens of places. Opry Mills is the largest outlet and value retail shopping destination in Tennessee, offering more than 200 shopping, dining, and entertainment venues. So, as you can see there are a lot of things to do in the Music Valley and Opryland area. Music Valley has much more including many, many hotels and some of Nashville’s finest campgrounds including Two Rivers Campground, Jellystone Park and the Nashville KOA campground. Come and visit us real soon!